The talk from Annie’s medical team has turned from medicines, x-rays, tubes, and sutures to oral feeds, parent education, discharge checklists, and insurance details for transport home. That’s right: home! It’s been confirmed that Friday at noon Annie and I will be picked up from CHOP by the ACH med flight team to return to Little Rock! Looks like we will spend a few days finishing any work on her feeds and final discharge checks before we introduce Annie to our house, but at this point, Little Rock is sounding a whole lot better to me than Philadelphia. Philadelphia will always hold a wonderfully special and quite sacred place in my heart. This is the city and these are the people who saved Annie’s life. Over the last week and a half, I’ve learned various routes to walk to CHOP each morning. I’ve frequented a few local restaurants. I’ve witnessed more than one angry outrage between a pedestrian and a taxi cab driver. So I’d say, I’ve pretty much got this whole being in Philly thing down. 🙂 But because our stay here has meant so much, I’ve started thinking about taking a souvenir home with me. Should it be a Penn sweatshirt to remember the beautiful campus I stroll through every day? Should it be a CHOP fleece to remind me of the warmth and comfort the hospital has offered me during our stay? Should I keep my orange Ronald McDonald resident bracelet forever? No. None of these would be enough. I realized that I don’t need to buy a souvenir. I’m leaving here with so many souvenirs imprinted on my heart and mind. For example, now when I hear an ambulance roar through the neighborhood streets, I’m paralyzed with empathy for the family who occupies those gloomy seats. When the tweeting alarms ring down the 6th floor hallways and the intercom blares “6 south, 1 bed 2,” I know what it means. The nurses’ faces flush stark and white, and the designated caregivers drop everything to rush to the scene. It’s a CPR call for a patient in Annie’s former pod. I cry, shudder, and pray! That could’ve been us. It really could’ve been us. When a new family is rushed in and crowded by the surgical fellow and research team, I know what their tomorrow holds. And then I see their baby on that tomorrow, lying limp and still cold from surgery. I pray for his parents who are about to see the haunting reality of these congenital heart defects. I pray for him, too, that in a matter of days his parents may also be able to celebrate the miraculous hand of God through our shared surgeon. This is a place that I want to always remember, but in a way I’d also like to forget. Even though Annie has done well, with just a little ways to go, I still grieve. I still don’t want to spend the first 2 1/2 weeks of her life in the hospital. I don’t want to know what those alarms mean. I don’t want to feel what those parents feel. And most of all, I don’t want to return here in 3 months to do open heart surgery all over again. We rejoice in Annie’s recovery, but we are also coming to terms that this is a new life for us. This new life doesn’t end when we discharge from ACH. I needed the CPR class for a reason. I need the cardiologist on call number in my phone on speed dial, because Annie may not look like it, but she will always be different, fragile, and half-hearted. Even now though, I choose joy! Instead of any sweatshirt or bracelet, I’m getting the best souvenir from Philadelphia! They saved Annie’s life and gave me this day and the hope of tomorrow with my Annie. 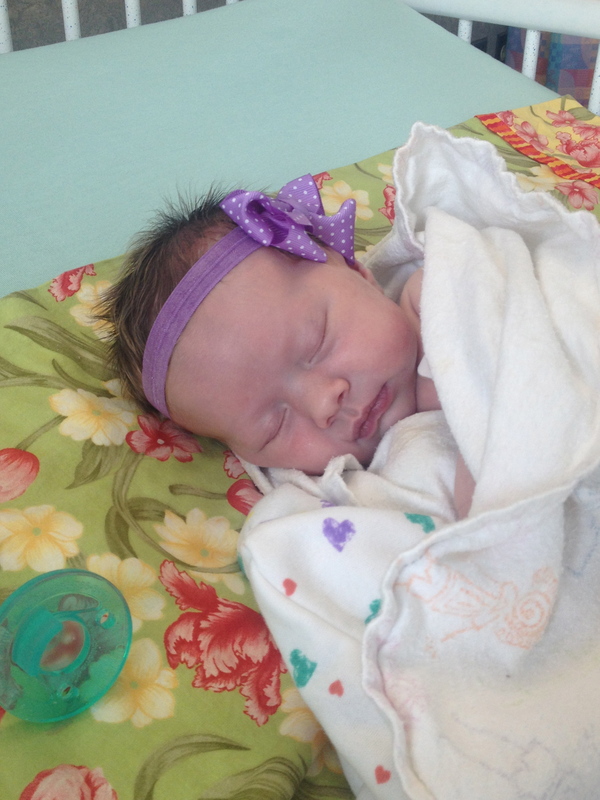 My sweet newborn daughter will be at home with us soon! What more could I need to remember? Waiting for the med team to come get me! I have now been in Philadelphia for an entire week. Somewhere thousands of miles from home and 30 windy degrees chillier: a cold place where I don’t know a single soul. That can be lonely and scary! But God has so graciously provided for us here. When I knew we’d be coming, I contacted some FamilyLife friends who may have connections. 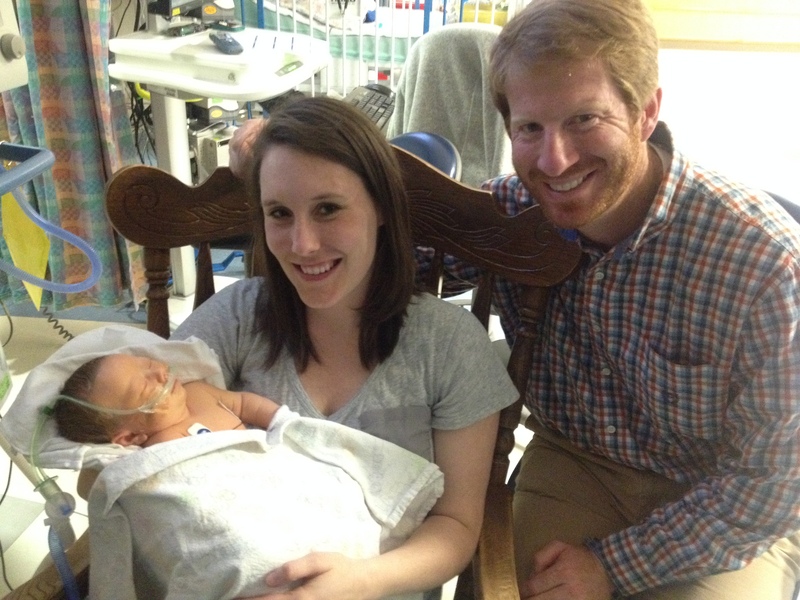 Of course, because of the grace of God, a FamilyLife staff couple lives right outside of Philadelphia. They gladly picked up Matt from the airport, brought in a bag of goodies, hugged us, prayed with us, and loved us that crazy Monday night. The next morning, during Annie’s surgery, Sharon even came and sat with us while we waited to hear the details from the operating room. How wonderful to have a friend’s support in such a sacred moment in a faraway place! Several of the hospital staff asked if we’d like a pastor or chaplain to come pray with us, because presumably at home we would have the support of our church body. Again, because of God’s specific provision, we were able to say that we had contact with a pastor here. One of Annie’s cardiologists in Little Rock lived and worked here recently. He connected with his church family in Philadelphia and the pastor came to visit Matt, pray over Annie, and even offer his home to us if we needed anything. We’ve had a comfortable place to stay: the Ronald McDonald House. Unfortunately there was a waiting list to get in and the house that accommodates 48 families was full. So the first two nights we stayed at the hospital in a family room. I was so thankful to have a bed to sleep in and a community shower. Wednesday, a room opened for us at the Ronald McDonald House so we caught the afternoon shuttle to head over to check in. How humbling to be warmly welcomed to a place that I’ve always naively assumed I’d only see the bedroom walls when my small group went to repaint them and only see their pantry when I donated my annual canned goods. As the volunteers kindly handed us our clean towels, then showed us the laundry room and the exercise room and the family kitchen, I knew I’d never be the same. How could I have been so cold, so uncaring, so not even thinking about all of these hurting people before this week? There is a constant waiting list for these 48 rooms. Heartbreaking that such a large place has such a long waiting list. And I was on that list this week. This weekend, I received a package delivered to the front desk of the Philadelphia Ronald McDonald House. Not somebody else. Not someone so unlike me. Not someone who could’ve done something different. The first morning there while eating breakfast, there was one other family in the kitchen. They were friendly and initiated conversation with us about where we were from and why we’re here. I know you won’t be surprised to find out that their 8-year-old daughter has Annie’s exact same heart defect and the surgeon who touched our Annie’s heart touched Natalee’s too. God always shows up! Orchestrating the most incredible details. Never ever letting us wonder if this is His plan or where He is in the midst of it all. As today begins a new week, I’m so thankful to be on this side of the Norwood procedure. Annie has recovered so well over the past 5 days. But it hasn’t been without its ups and downs. All day Wednesday and Thursday, Annie was in so much pain that she’d choose to hold her breath. Her heart rate and oxygen sats would plummet, the alarms would blare, and the whole pod’s nursing staff would crowd us out from around her bed using all kinds of unsettling apparatus to help her breathe again. We literally sat on the edge of our bedside seats not knowing if the next minute she’d be gone. Friday morning, finally she started doing much better. She’d still have episodes, but instead of needing intervention she learned how to regulate her breathing on her own. 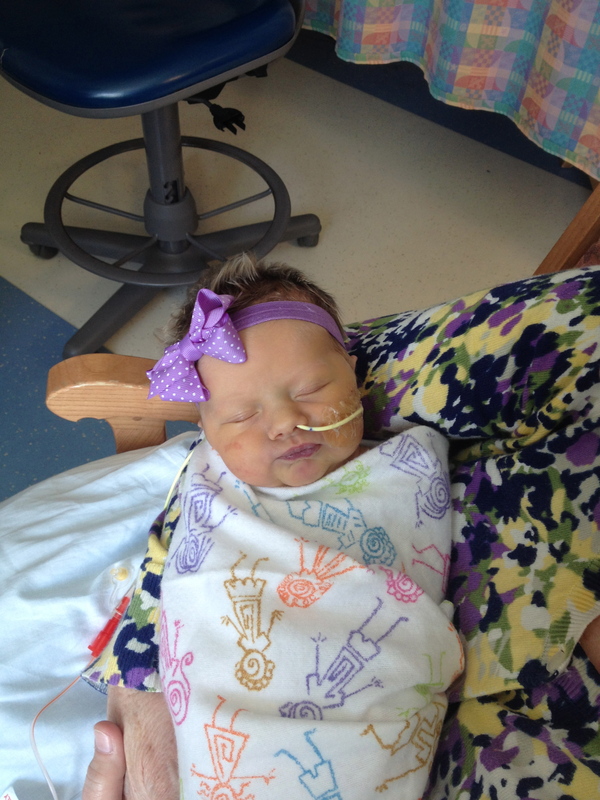 She began getting breast milk through her NG tube and started to learn some comfort measures. 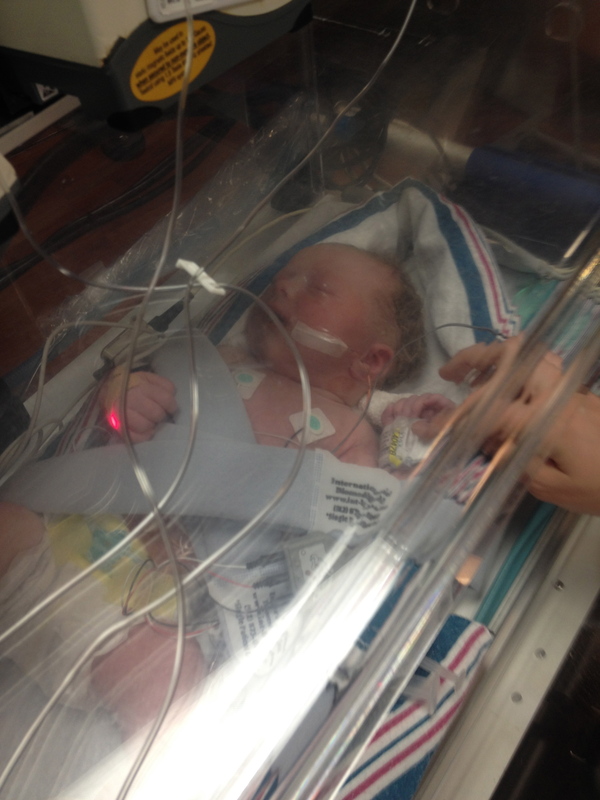 By Saturday her administered oxygen was at normal room air and she was happily digesting full feeds. 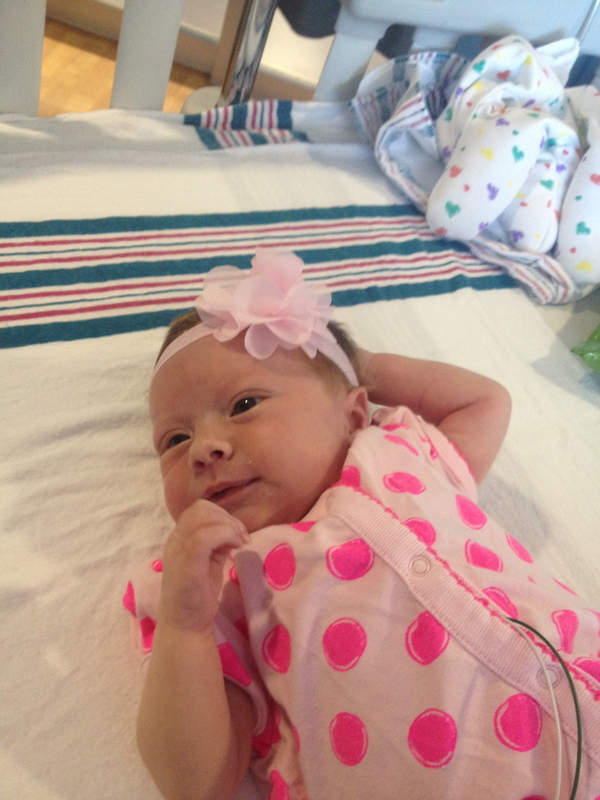 It’s purely miraculous to look at the daily pictures of her progress since birth. Today, instead of her tall medical tower being crowded to the sky with numerous medicine drips going into her RA lines and UV lines and UA lines and pacemaker wires and EKG monitors and on and on, she simply has one drip bag filled with mommy’s milk. All of her cords are out. The only thing that she still has in is her NG tube (which she could go home with, depending on her success with oral feeds that will begin tomorrow). We get to hold her all day. We are practicing nursing by latching. I can change her diaper. I can swaddle her. She is mine! And today we leave the ICU and move into the step down unit! This is feeling more and more like home. And I’m thankful to be in a place that has treated us as if we were already there. There have been moments and temporary day-to-day situations I’ve experienced where I thought, I’ll never survive this! It might’ve been an extreme work stress, a family dilemma, a breakup. (Sorry, high school heartbreak, you’ve got nothing on this now!) Still, never until yesterday have I literally questioned whether or not I could make it through all that I knew could and would unfold in a day. Monday started with unconfirmed final transport plans to get Annie to CHOP. When I got to Children’s they told me we may not be able to go anywhere, since we hadn’t confirmed it all with insurance. All that flashed in my mind was my Annie missing her chance at survival by not making it to Philadelphia in time for Tuesday morning surgery. Thankfully, Annie’s dedicated and caring cardiologist was equally concerned. He made a few quick but direct phone calls, and minutes later approval was granted! Me and Annie’s nurse squealed in unison! Though the transport was requested, it was far from easy. The team arrived again with their bulky isolette that my tiny Annie was to fill. 30 minutes of cord untangling and rewiring through countless alarms had her nestled in a bed of blankets and me frazzled beyond belief. 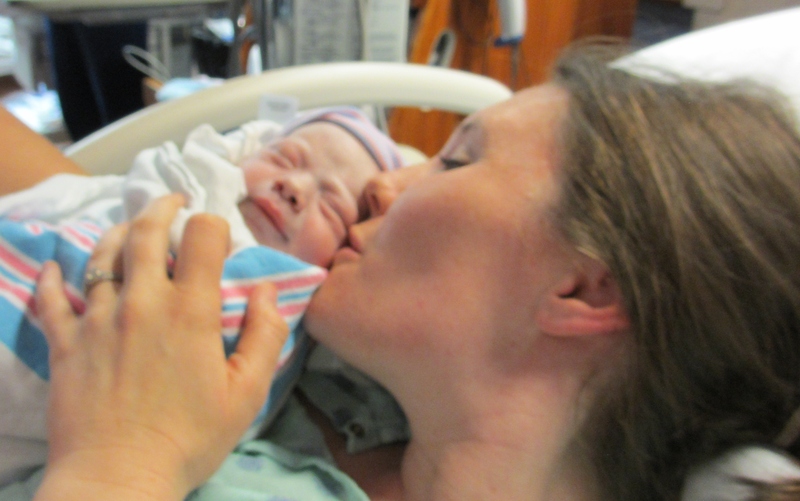 They quickly wheeled her down busy hospital hallways, while my 4-day postpartum body tried to keep step. But what hurt worse were the awkward stares and whispers from the passersby. Gasp! “There’s a tiny baby in there. Lord, help them.” “Oh girl, I sho’ glad that ain’t my baby.” I stared at the white tiles, blinking back stinging tears. We made it to the ambulance loading dock. They hoisted Annie roughly into place, and I timidly took my respective seat next to her. No seat a parent should ever have to fill. The sirens roared and off we sped to the Little Rock airport to catch our pilots, impatiently waiting departure. The idea that babies’ heads are to be held carefully and kept from movement must be purely a myth because the jostling and jolting that Annie endured is far from what you read about in What to Expect…The First Month. We then loaded our tiny plane and I found that the bumps had only just begun. 3 1/2 tousled hours later the Philadelphia ground was a glorious sight. There was an ambulance waiting to retrieve us and again, off we sped to another hospital. The team at CHOP was waiting our arrival. So when we made it to the 6th floor we were welcomed by a hungry mob of information seekers, needle prickers, and wire replacers. Annie squalled with each flip and turn needed for the tests, and I confusedly tried to answer a million questions and think of things to ask as they briefed me on her surgery and where I would sleep and where I would pump and who to call for emergency and my parent badge and oh yes, my social security card to confirm they’d mobbed the right mommy. Phew! I had never been so happy to see Matt when he finally arrived several hours later! But at the end of an eternal day where I simply breathed constant prayers for God to carry me through, I got to hold my girl! I rocked her late into the night, singing “He’s got our little baby Annie in His hands…” and told her how special tomorrow would be because God would use her teeny self to show how big and powerful He is. After a restless night of Matt and I hanging off opposite edges of a twin bed, 4am came early. It was time to begin this day that would change every other day that we know from now on. We held Annie again this morning and prayed for her comfort, our comfort, but even more for God’s presence and glory. The minutes haunted us on the screen above and our time with her grew short. The anesthesiogist came and I passed her once again to someone I knew could care for her better than I- a hard thing to admit as a mother. There were more white tiles to stare at as we strolled down the cold, gray hospital hallways walking Annie to the operating room. One last kiss and she was out of sight. Our hearts broke. We rode the elevator to the conference room with the surgeon. He gave us the typical talk about what he’d do. And reminded us a side effect of the surgery was death. I think I’d prefer headache? If only it were that easy. Our nurse was to update us as surgery progressed, so we waited watchfully with phones in hand, jumping at every buzz. An hour later came the first update: She handled the anesthesia well, her chest was open, he had begun the work on her aorta. We waited for the next call: The technical work of the surgeon was complete, they were getting Annie off the heart lung machine and reinfusing her with her own blood. And the third call: It was done. Annie was stable and on her way back to her ICU bed. The surgeon was on his way to meet us. He said it went as smoothly as those procedures ever go. Her heart didn’t show swelling or too much bleeding so he was even able to close her chest. A HUGE success! We finally got to see her after another long hour passed. What a delight! There she still was. But instead of clenching our fingers and pouting her lips she lay still, looking lifeless and sporting a long white patch down her chest and cords draining blood from her heart. But now, she is breathing almost entirely on her own and beginning to wake up. A loud sound startles her and she kicks her leg in disapproval. “Just a few more minutes,” she requests as she drifts back into her medicinally-induced nap. But she’s there. It’s Annie. Our Annie! And it’s God, our God who is sustaining me minute by minute while my heart feels like it’ll beat out of my chest from the ache of seeing her this way. And we celebrate! The Norwood surgery is behind us! She’s winning her first fight for survival and so am I. These are the things you’re not supposed to hear when you’re excitedly expecting your second precious baby girl. It’s not supposed to go like that. She was born Thursday, April 10, at 4:28 am after 6 hours of natural, unmedicated child birth at exactly 39 weeks. She let us know she had arrived with the most delightful, ear-piercing wail. Her skin shone a healthy pink hue. 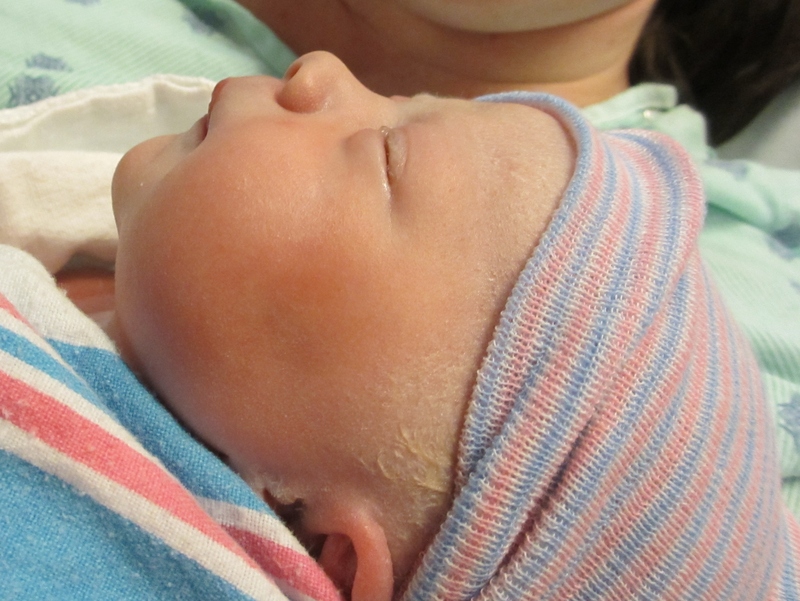 She was 7lbs 6oz of round cheeks, wrinkly toes, and thick dark hair. The awaiting NICU team whisked her quickly from my doctor’s hands into the corner of the delivery room to start taking stats. Apgar at 1 minute was 8! Apgar at 5 minutes was 9! And all the room knew that it wasn’t supposed to go like that. Because she looked so good, I got the most wonderful treasure: after 9 long months of waiting and wondering, I finally got to hold her. My salty tears dripped onto her rosy cheeks as I kissed her and snuggled her and whispered softly to her of how long I’d waited for this moment and how my heart ached with love. I pressed my cheek to hers and thanked God for His perfect gift of my Annie. But the moments were short and few. It was time to place her back into their hands. They assured us we’d see her again before she was transported to Children’s. The waiting moments were long and seemed many. But in about an hour she came back into our room. Not swaddled in a cozy newborn bassinet, but tangled in wires and monitors, strapped inside an enclosed isolette attended by a three-person uniformed med flight team. We didn’t sign paperwork asking that she be breastfed and bathed in our room. We signed papers that said we agreed to allow them to take whatever measures necessary to save her life. Matt left me to go to Children’s, while I stayed behind to rest and recover. He sent sweet pictures of him giving Annie her pacifier and Annie clenching his strong hand with her tiny fingers, while Annie lay confined to her miniature hospital bed. It’s not supposed to go like that. It’s been wonderful to have our Annie finally here. But we’ve had many surprises. She’s done much better than the doctors were expecting for someone with her heart condition. And because of that, our cardiologist challenged us to give her the absolute best chance to continue improving. He, and other doctors here, encouraged us to transfer her to Children’s Hospital of Philadelphia (CHOP), the hospital with the #1 surgeon known for performing the surgeries she needs. They began initiating the transfer by talking to their contacts at CHOP, and also looking at the head surgeon’s schedule. CHOP confirmed that Annie is a perfect candidate for their institution and they have no doubt about her surgery because it’s a surgery that the surgeons there perform pretty much daily. They think she should be good and healing in no time. This morning we heard that CHOP would officially accept her. The surgeon has a opening in his schedule for Tuesday afternoon. So, tomorrow morning Annie will be transported to CHOP by jet. I’ll get to travel with her, and Matt is catching a commercial flight to Philadelphia. This is really great news! We know that her surgery, recovery, and hospital time will be shortened by being there. But we know that our time as a detached family will be so long away from each other for most of it, away from Audrey for all of it, away from our support system of family and friends here in Little Rock who have literally been the hands and feet of Jesus to us throughout the pregnancy and very tangibly over the last few days. They have proven to us that even though at times, we’ve tried to do it on our own and research on our own and survive it on our own: it’s not supposed to go like that. So, sweet friends, we love you and thank you for walking this with us. We desperately ask for your prayers as we travel tomorrow and Annie’s surgery is Tuesday. Again, this is not a journey we want to be on. But it’s one we know that God had planned before our time or Annie’s time began. So we rest in His continued proven faithfulness. We know that as we’ve watched Him be faithful before, He will surely be faithful this moment and the next and the next.